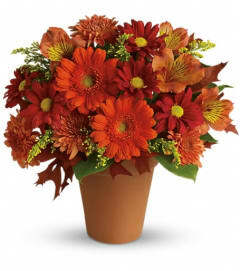 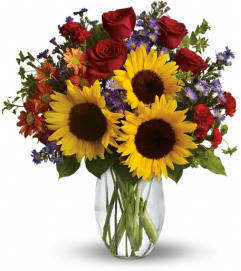 Joyfully welcome the harvest season with this magnificent bouquet of fall blooms, beautifully hand-arranged in a stylish hand-glazed kitchen crock. 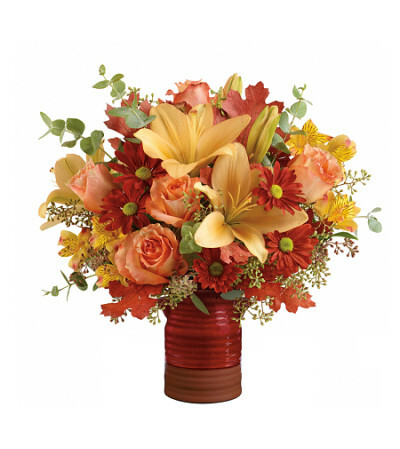 This beautiful arrangement includes peach roses, peach asiatic lilies, yellow alstroemeria, red daisy spray chrysanthemums, seeded eucalyptus, spiral eucalyptus, and rust-colored transparent oak leaves. 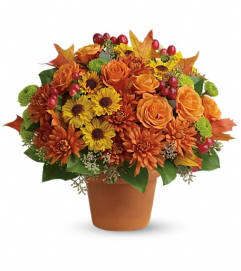 Delivered in an Heirloom Crock container.